Gamification became a simple solution for a long-standing sanitation problem… observations of innovative toilet technology from around the world – or how an innovative fly solves the plaguing problem. When you travel to different countries, you can learn a lot. For example, how other cultures deal with common problems we share as humans and what solutions they find. One of these all-time problems is, for example, the cleanliness of urinals in men rest-rooms in high-traffic public restrooms (toilets) such as in airports and train stations. Without diving deeper into the real mess that meets the eye, let’s just say that men sometimes seem to lack aim causing spatter and leading to an unpleasant sanitary situation in the surrounding area – you get the idea. This mess needs to be cleaned up several times a day. It is a job nobody likes at a cost that operators of restrooms would prefer not to spend. So, how can the mess and the resulting cost be avoided in the first place? It is also hard to tell where exactly this ‘sweet spot’ is located since urinals come in a surprising variety of shapes and sizes. Therefore, even with the best intention the user lacks the necessary information to use the urinal in an as clean way as possible. In summary, there are many aspects to consider in tackling the resulting problem. Think about it for a moment, how would you approach solving the problem? What ideas do you have? Here is a solution that used gamification to reduce cost and favorably cleaner facilities as a by-product to the approach. Instead of launching an educational campaign, print user manuals, enforce fines, or negotiate lower salaries of cleaning staff, the Dutch came up with an ingeniously simple idea: they put the picture of a common housefly right on the sweet spot in the urinal bowls in male restrooms at the busy Schiphol airport in Amsterdam/Netherlands! The ‘fly’ started out as a low-cost peel-and-paste decal and is now also available already etched right into new bowls by the manufacturer. This little fly turns the ‘aiming’ handicap into an engaging little game challenge: It seems to appeal to a man’s inner child as well as waking deep-rooted hunter instincts. It also becomes a welcome pastime during an otherwise boring routine. It becomes a very personal and fun activity ‘shooting the fly’! We discussed “Collective Intelligence: The Genomics of Crowds”, i.e. gamification from a crowd-sourcing perspective and that a well-designed game works by combining a basic set of ‘game genomes’ (strategy, staffing, structure/process, and rewards) successfully. Interestingly, these same genomes can also be applied to this very personal ‘fly shooting’ game. Strategy relates to the aiming challenge and pastime as a goal. One person alone decides and does the ‘work’ of aiming with an immaterial reward that remains known only to the player. University of Illinois’ Professor Mary Berenbaum confirms that men apparently have “a deep-seated instinct to aim at targets” that the fly satisfies and catches their attention. Did it work? It does, according to Aad Keiboom, the manager at Schiphol Airport: the “spillage” reduced by 80% after applying ‘the fly’. 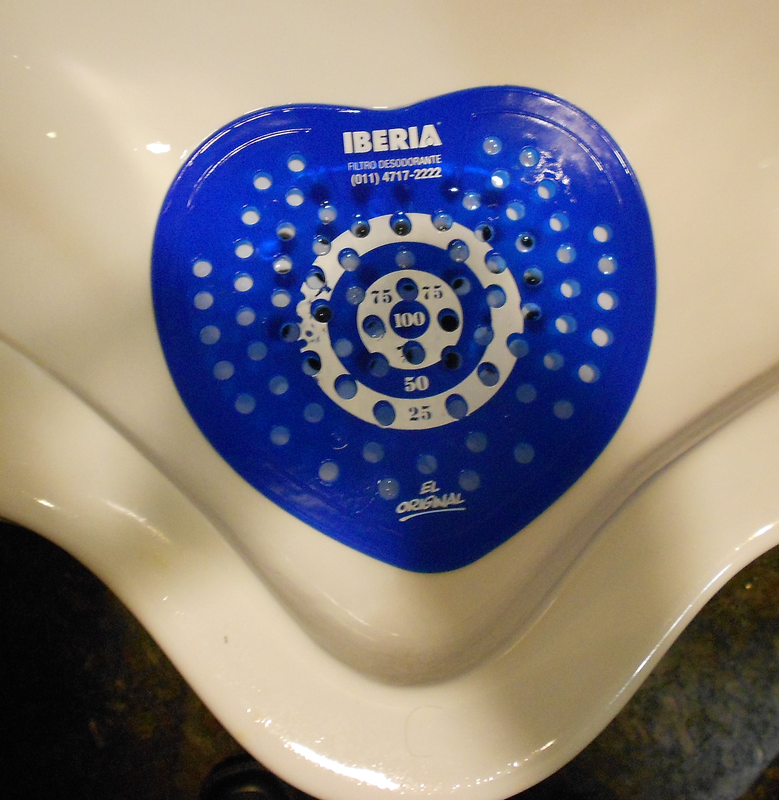 The spreading and commercial success of urinals with etched-in flies is solid proof. Does it have to be a fly? Reportedly, the idea to use a fly to reduce “misdirected flow” is not new. It was traced back to maintenance man Jos Van Bedoff during his time with the Dutch Army in the 1960s. He noticed a similar result after red dots were applied in the barracks urinals. What is new in one industry or setting may be an innovation in another (“Imitators beat Innovators!“). This principal also applies for “lost innovations” that get re-invented at a later time, like the bee that vanished and then re-emerged as a fly in a different country over a century later. As a variation of the ‘fly target’, I recently found a candle with a flame that serves the same purpose as the fly in Germany – perhaps, the Germans have more empathy for insects? I noticed this gamified innovation in three countries: the Netherlands, Germany, and Japan. – Why don’t we see the fly more in densely populated Asian countries or the USA? While it is safe to assume that the sanitary issue is rather universal, what these three countries have in common is high labor cost. Therefore, they prefer solutions that build on automation technology and process over having a squad of cleaners attend to the mess several times a day. If you want to try it out and start a low-cost experiment of your own, just get some ‘fly’ stickers! So far, I found most advanced restroom technology in Japan at Tokyo’s Haneda airport. Aside from being as clean and inviting as a restroom can ever be, a number of buttons on the wall next to the toilet bowl allow a person to regulate not only warm water showers for different body areas built right into the toilet bowl. To me, one particular function ranks somewhere between functional and entertainment. There is a button to generate flushing noises without actually flushing water! You can even regulate the volume of the flushing soundscapes! I am not sure what the practical need is for having this unique feature, but it’s fun to play with anyway. Japanese toilet “flushing sound” button? Author Stephan KlaschkaPosted on November 1, 2012 February 4, 2014 Categories Gamification, InnovationTags Amsterdam Airport Schiphol, bee, design, Dutch, fly, Gamification, innovation, Japan, Netherlands, New York City, Restroom, Schiphol Airport, Toilet, Urinal1 Comment on A Splash of Innovation!